As you saw yesterday, all outfits can't be winners - or at least we don't always feel 100% about our outfits, yet still put them on, and still survive the day. And as you see today, I'm trying crops again, except I'm going for broke this time. And I know that all trends are not for everyone, but I've been not-so-subliminally sold on the whole slouchy - glorified Hammer - cropped trouser look for months now and finally had to bite when these pants popped up in my size during the last big Crew sale. So, can't touch this, ladies, 'cause I'm too legit. Notice the steely-eyed concentration of "these pants DO work for me." In keeping with taking cues from others and my affinity to not the healthiest eating, I saw this post recently for a delectable pizza and runny egg treat so immediately I had to recreate it. Except I didn't have the dough. And didn't want to run out to the store. And couldn't even be bothered with turning on the oven. But was hungry for dinner, so I still plowed forth. Lightly spray pan with Pan or use light oil, preheating on the stove in medium heat. When pan is warm, put on naan, top side down - let heat through and toast for 1-2 minutes. Flip naan and sprinkle shredded cheese on top - heat bottom for 2 minutes until cheese start melting and bottom is toasted to your liking. Remove naan from heat. Using same pan, spray some more Pan or use oil or butter. Crack an egg and fry it. Meanwhile, wrap bacon in paper towels and "cook" in microwave on high for 2 minutes - check for doneness and heat for additional 30 second intervals if needed to get to desired consistency. Flip egg over gently to cook all the whites and then remove from heat and lay it on the naan. Crumble bacon on top. Chop up scallion and scatter on top of that. Sprinkle with pepper if desired. Takes less than 10 minutes in total and still yummy. ♦ Kristina J is giving away a $30 gift card to Anthropologie. Contest ends today! ♦ Kimberly from Fashion Momma is giving away a $25 gift card of your choice from select retailers, plus loads of other goodies. Contest also ends today. ♦ Roxy from Effortless Anthropologie is giving away a butterscotch twist cowl from Jill Lauren. Contest ends March 6. ♦ BonBon Rose Girls has two giveaways going - one for a Plank yoga mat ending March 6, and one for a $75 gift certificate to CSN Stores ending March 8. ♦ Fashion Meets Food is giving away a cortez dress from Shabby Apple. Contest ends March 7. ♦ Miss Mallory is giving away away a $15 gift certificate to CSN Stores. Contest ends March 7. ♦ Tippy from Tres Tippy is giving away a $45 gift certificate to CSN Stores. Contest ends March 8. ♦ Lisa from Confessions of a Call Center Gal is giving away your choice of any Perricone MD product worth up to $150. Contest ends March 8. ♦ Tieka from Selective Potential is giving away an ASOS cape, courtesy of Magpie Girl. Contest ends March 8. ♦ Kathryn and Carol from In Pursuit of Pretty Things is giving away a $100 gift card to Anthropologie. Contest ends March 9. ♦ Shea from Bon Chic Bon Gastronomique is giving away a $45 gift certificate to CSN Stores. Contest ends March 9. ♦ Jessica from What I Wore is giving away two Michael Kors trench coats. Contest ends March 10. ♦ Debby from Inspired Design is giving away a revival tassel necklace from Stella & Dot. Contest ends March 10. ♦ Justine from Fetching Fashions is giving away a $25 gift certificate to Apothica. Contest ends March 11. ♦ Dea from the dea diaries is giving away a $100 gift certificate to Shopbop. Contest ends March 11. ♦ Marilou from Twenty York Street is giving away two tickets to Ottawa Fashion Week. Contest ends March 15. ♦ Tara from Little Girl Big Closet is giving away three gift cards to Anthropologie, worth $50, $25 and $25. Contest ends March 20. ♦ SewPetiteGal is giving away three pearl ribbon necklaces. Contest ends March 24. ♦ Really Petite is giving away two $100 gift cards to AT Loft and a jewelry from Loft for a third winner. Contest ends April 1. Oh goodie, another blog about shoes. Love thoes black and whites the colorblocking is amazing. You look SO chic, Lisa. No joke. It takes a special kind of confidence to pull off pants like those, and you look like you're doing so without even trying! Love your outfit! Are you old enough to remember MC Hammer? ;) Love the tasty breakfast treat, LOL at no over/no dough business, I'm all for the "ready to cook/eat in under half hour" business. Have a great weekend! Go Hammer Go! It's Hammer Time. sorry, I couldn't resist. But I second Tara, you look super legit chic! You GO girl. 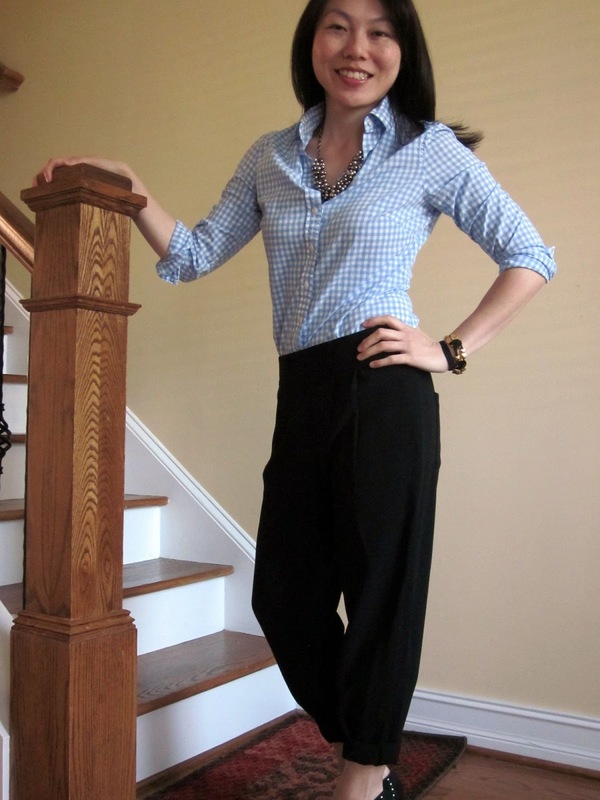 I love the pleated trouser pant! I have love-hate relationship with myself in these kinds of trousers, but for you I have a love-love kind of feeling. I have to say, I've been hating on pants like that for some time, but you have managed to make me like them! Perhaps it was the steely-eyed concentration. On a side note your naan creation looks extremely delicious, I always keep some of it on hand, and think I may try my had at this! 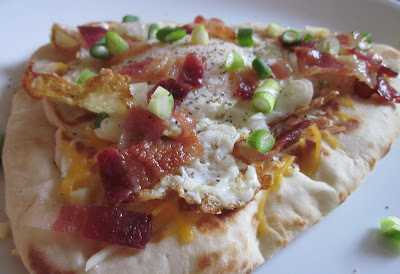 That breakfast pizza looks soo good as I'm sitting here, starving for some breakfast right now. I really love that top! And the look all together is WINNING! Your breakfast pizza looks really good...I think I'm going to try it this weekend! Also, thanks for posting all of these great giveaways...I would have overlooked some of them! Way to go with this outfit Lisa, I really like the mix of the pearls with the button-down. I am totally jealous in how you are rocking those pants! They look harmlem-esque but with more fashionable style. Nice baubles as well, really glammifies the look further! Lisa, you look so sophisticated in your pants and ginham shirt combo - definitely not man repeller. And definitely not wrong! You look so darn good - i mean it. 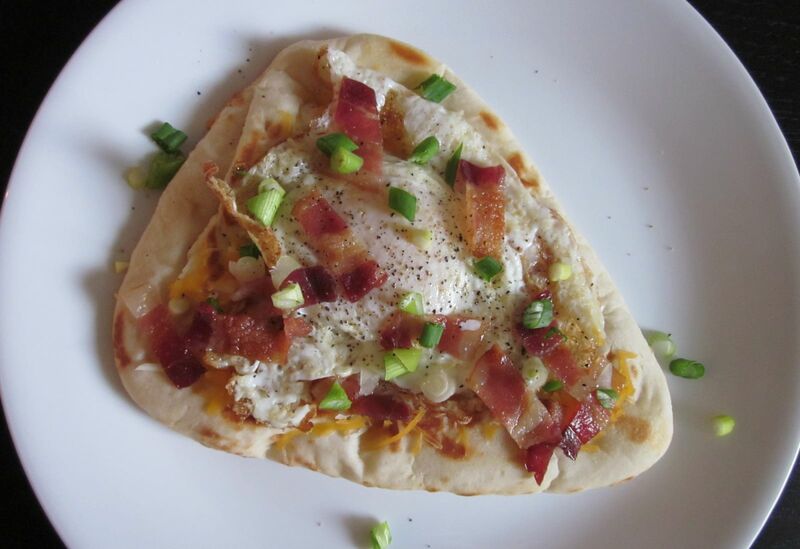 Breakfast pizza looks yum! happy weekend! You are hilarious! I love that necklace! I'm excited to wear my Crew pleated cropped pants! You look amazing in the jersey pants. 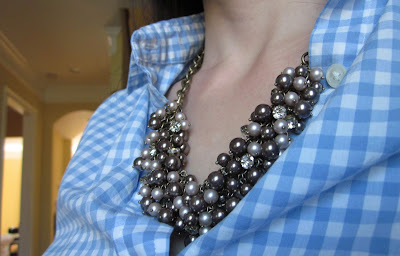 The gingham and pearls work so well it! A definate Jenna Lyons Chic ensemble!! I always love your outtakes Lis - so fun! Loving your gingham shirt nonetheless! Thank you, thank you for the shout-out! YOU LOOK INCREDIBLE IN THESE! I actually think the trend looks pretty silly on model types- like they are wearing a diaper. But on you- the "slouch" is perfect- amazing drape. WOW. Okay, my breakfast of an English muffin and yogurt is looking pretty darn pitiful next to your breakfast pizza. And may I just say, you are looking fabulous, once again, in your gingham shirt. 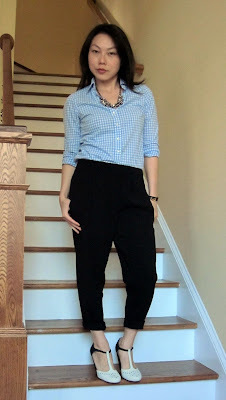 I actually really loved the first cropped pants look, and the slouchier look here is another win in my book. Have a great week! Thanks for your comments, ladies - these pants are a keeper for me, but I think this will be my only foray into slouch cropped trousers, I'm not brave (nor gazelle-like) enough to pull off some baggy sequin sweat pants or the full-on harem pant look. My BF was already giving me enough "are those *real* pants or aren't they?" looks, haha! The silhouette of these pants is lovely on you!